Strong investment of US$8.7B in Q4’17 propelled global fintech funding over the US$31B mark for 2017, sustaining the high level of investment seen in 2016, according to the KPMG Pulse of Fintech report. This brings the total global investment in the fintech sector over the past 3 years to US$122B. While global fintech deal volume declined in Q4, the number of venture capital (VC) transactions exceeded 1,000 for the fourth consecutive year in 2017, with private equity (PE) deals reaching a new high of 139. Fintech M&A also ticked up for the year with 336 transactions in 2017. Among fintech sub-sectors, both insurtech and blockchain saw record levels of VC investment and deal volume in 2017, with insurtech accounting for US$2.1B across 247 deals and blockchain generating US$512M of investment across 92 deals. Geographically, the US accounted for almost two-thirds of global fintech investment in Q4’17. In Asia, fintech investment moderated to US$748M for Q4’17, to reach only US$3.85B for all of 2017, after more than US$10B in funding in 2016. 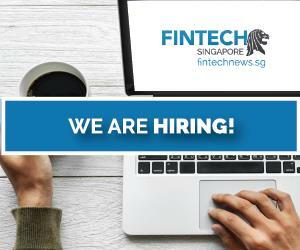 Singapore achieved a record high of US$229.10M of fintech funding in 2017. This was attributed to two of Asia top 10 biggest deals taking place in Singapore in Q4 – GoSwiff’s US$100M purchase by Paynear Solutions which boosted deal volume to an unmatched high over the prior 3 years, and Smartkarma’s US$13.5M series B round. 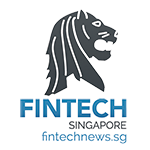 The country continued to showcase its value as an Asia-based fintech hub, particularly in areas like blockchain, AI, and machine learning. Singapore has also been able to attract a significant amount of foreign attention; well-established VC funds, large corporates and even more established fintech companies have made investments or set up shop in the country as a base for expansion into Southeast Asia. Heading into 2018, the MAS has targeted financial inclusion as a critical priority, with the desire to make it more accessible and cost effective for individuals working in the country to remit payments to family elsewhere in the region. said Chia Tek Yew, Head of Financial Services Advisory, KPMG in Singapore. Total global fintech investment was US$31B, the same level of investment as 2016. 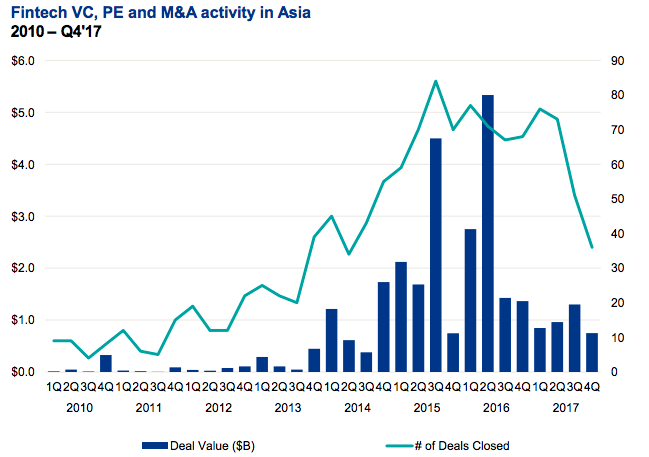 The number of PE deals reached a record high of 139 in 2017, providing US$17B in investment. The median deal size for angel/seed-stage deals was up to US$1.5M, compared to US$1M in 2016, while the median deal size for early-stage rounds was also up to US$5.5M from US$5.1M in 2016. 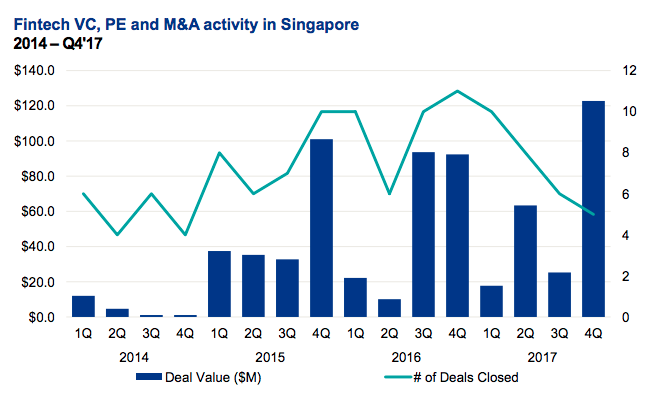 The median deal size of late-stage deals decreased year-over-year, from US$19.1M to US$16M. Corporate participation in VC deals reached a record high of 19 percent in 2017, although corporate VC investment globally was down significantly year-over-year, with just US$5.4B invested in 2017 compared to US$9.6B invested in 2016. Global fintech investment rose marginally from US$8.5B in Q3’17 to US$8.7B in Q4’17. Global fintech deal activity dropped to 307 deals in Q4’17, from 327 in Q3’17, with VC deals dropping from to 227 from 250. While noticeable, the decline in fintech deal activity has been far more moderate compared to declining deal activity in other technology sectors. Global VC funding dipped slightly from US$3.7B to US$3.2B quarter over quarter. Fintech exit activity achieved a new high of US$2.4B in Q4’17, highlighting the growing maturation of some fintech subsectors. Blockchain continued to garner a significant amount of attention from investors in 2017, with VC investment in particular achieving a record high of US$512M. 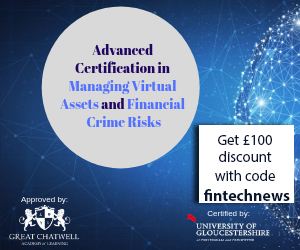 Blockchain use cases continued to be developed in numerous jurisdictions. 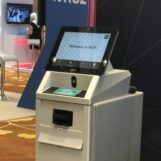 In Singapore, for example, three Asian banks and the Monetary Authority of Singapore (MAS) recently worked together to develop a blockchain proof-of-concept (PoC) aimed at streamlining know-your-customer (KYC) processes. Source: Pulse of Fintech Q4’17, Global Analysis of Investment in Fintech, KPMG International (data provided by PitchBook) February 13, 2018. After a solid US$1B+ quarter in Q3’17, total fintech funding in Asia declined to US$748M across 38 deals in Q4’17. VC funding faltered considerably in the region, dropping almost 50 percent quarter over quarter to US$550M. Decreased fintech investment in China accounted for much of the decrease in investment in Asia. China saw just US$45.8M in investment in Q4’17, while total investment in 2017 was US$1.33B. On an annual basis, total fintech funding in Asia was US$3.85 billion in 2017 – a massive drop-off from the more than US$10B invested in 2016. On the positive side, corporate participation in fintech deals skyrocketed in Asia during Q4’17, rising from a twelve-quarter low of 11 percent in Q3’17 to reach a new high of over 31 percent. 2018 could see a renewal in fintech activity in China, particularly if China-based unicorns are able to hold successful IPOs. China-based Lufax will be one to watch as it has already publicly announced plans to hold an IPO in Hong Kong in April. The growing clarity around fintech regulations in China should also help bring investments back and help drive additional funding into the regtech sector over the next year. says Ian Pollari, Global Co-Lead, KPMG Fintech.